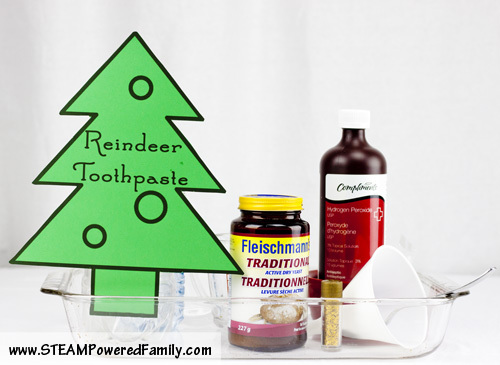 Reindeer toothpaste, could there be a better activity for this time of year? Christmas is coming and kids are super excited as they countdown the days to the sleigh bells on the roof. 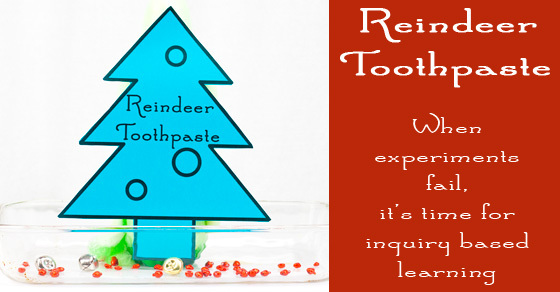 But those reindeer need to have sparkling clean teeth for the big day, right? 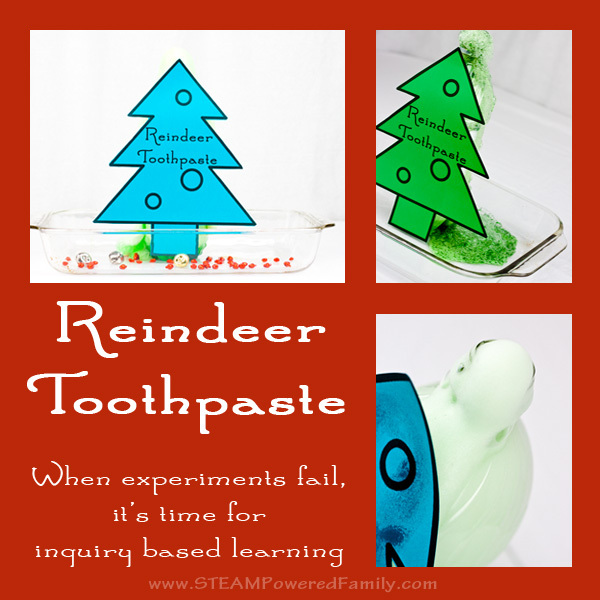 So we set out to make some extra special reindeer toothpaste for them, but a failure in the experiment gave us some chemistry learning that was unexpected. This is a holiday, and kid safe, twist on the traditional elephant toothpaste experiment. 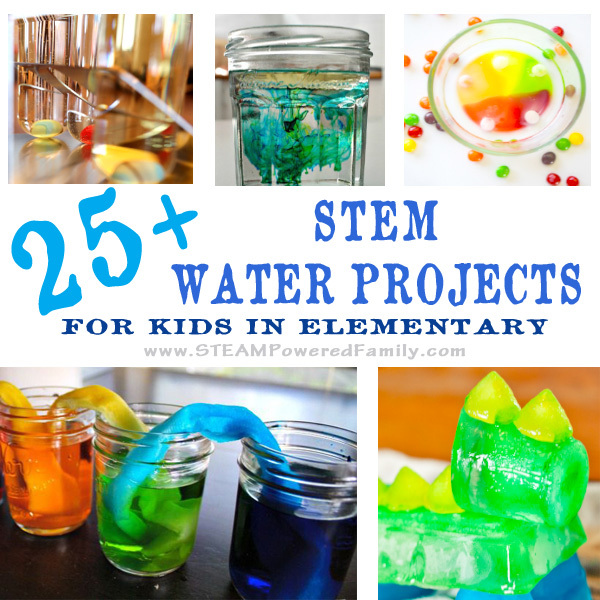 It is quick and easy to do and kids love this exothermic reaction (it gets warm). We’ve done elephant toothpaste many times with no issues. So when we came up with the idea for a holiday version to use on the reindeer we wanted to snazz it up a bit. We decided to try adding glitter and small bells to our experiment to make it more festive. We also thought the bells would provide us with a bit of a physics experiment to see if the reaction would create enough force to lift the bells from the bottle. It seemed like a great idea! Boy were we surprised when suddenly our experiment was a big failure! 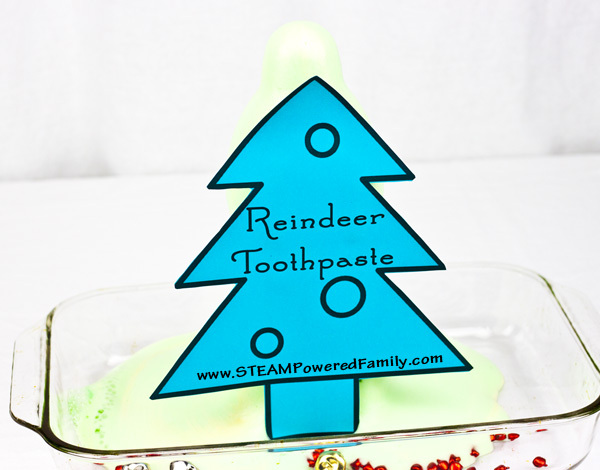 So first off, I’ll share how to make reindeer toothpaste in a way that will work. Clean and dry a 1 litre pop bottle. Using a funnel, add 1/4 cup of Hydrogen Peroxide (make sure kids use safety goggles and even protective gloves are a good idea!) and colour it with a few drops of food dye. Add a couple of drops of peppermint or mint essential oil. Finally add a squirt of dish soap. Now decorate your bottle. I’ve created a free printable you can use. 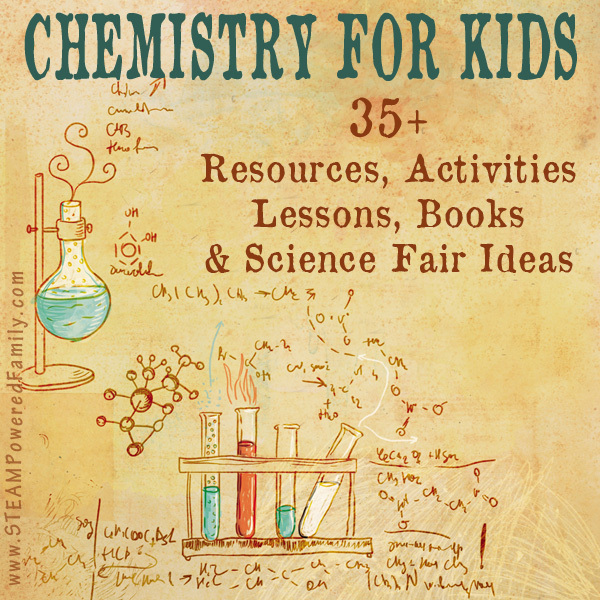 To access it simply join the STEAM Powered Family mailing list. Set your bottle in your large shallow dish. Now mix 1 Tbsp of dry yeast with warm water. My kids hated this part. They found the smell very overwhelming. You want to keep adding warm water until the mixture becomes runny. You need to be able to pour it. Once you are ready, use the funnel to pour the yeast mixture into the bottle, then remove the funnel and step back! You will get a great little eruption! If you don’t use a large dish or container on the bottom it will get messy! In this reaction the yeast acts as a catalyst to speed up the breakdown or decomposition of H2O2 into H2O (water) and O2 (oxygen). 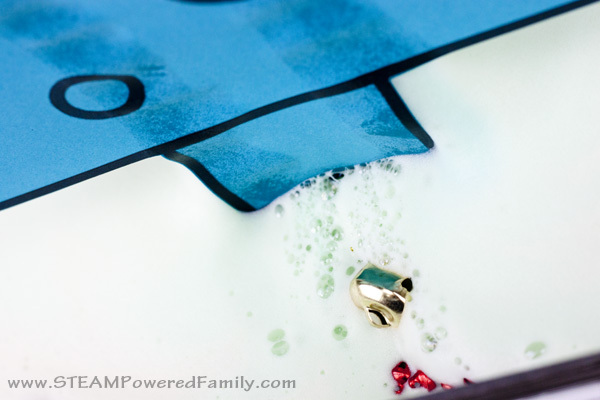 The dish soap mixes with the water and oxygen producing the foam. The reaction also releases heat which means it’s an exothermic reaction. I mentioned above that we had all these great ideas about how we were going to add glitter and little bells, but when we did, our experiment did not foam. It was this weak bubbly reaction. Very similar in look to a baking soda and vinegar reaction. There was no foaming and it definitely lacked the umph! we are used to from our elephant toothpaste reactions. We decided to run the experiment a few times and discovered that there was a reaction happening between our glitter (which was a metallic glitter, plastic should not cause this reaction) and our metal bells. 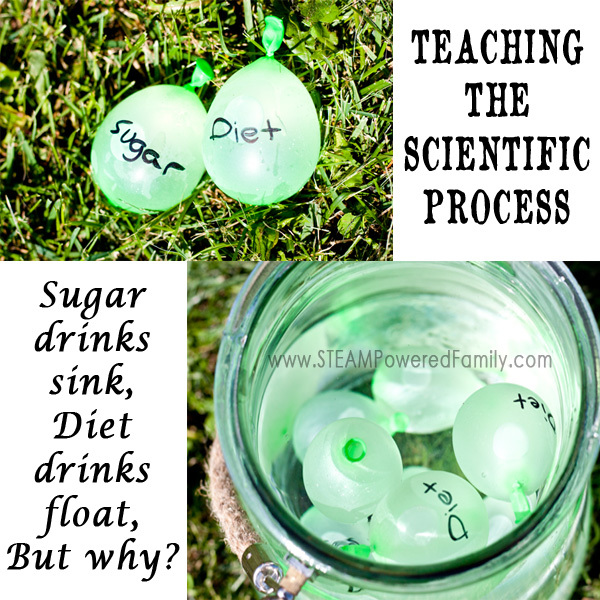 The best proof of this was when we put the bells in the bottom of our shallow container and did our toothpaste reaction normally with no additions. 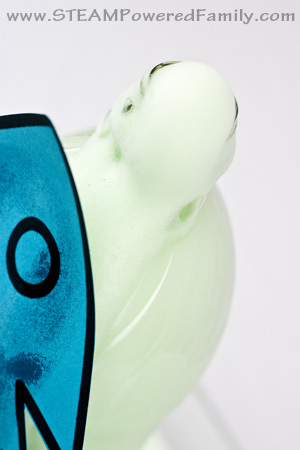 As soon as the foam started to come in contact with the bells it started to form bubbles instead of foam. Our failure was frustrating, but true scientists never give up! They evaluation, they study, they investigation, they learn and they experiment again. It was a great session in inquiry based learning, even if totally unexpected. Sometimes the best learning happens when you aren’t expecting it. Especially with science! 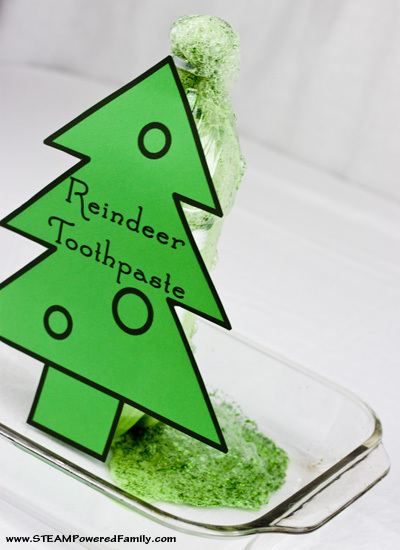 Looking for more reading on Reindeer Toothpaste? I just found this great write up from Playdough to Plato on her Minty Reindeer Toothpaste activity. And she even mentions the issue with metal! Which just confirms what we discovered through our investigations. It’s nice to have confirmation that our results were correct. Previous Post: « Rudolf Balloon Race – Simple Physics Fun!